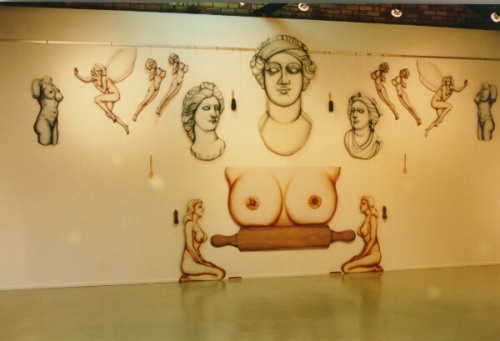 As well as seven framed images of the “Deadly Sins” this exhibition in the View Factory, which doubled as a warehouse cafe bar (one of the first of such configurations in Newcastle), featured large wooden cut-out painted works throughout the space, including fifteen or more friendly dogs. Most notable, was a Mexican sitting under the largest cactus ever seen in New South Wales. The media storm this exhibition created is difficult to quantify. I appeared in major national papers, radio programs in Sydney and Melbourne, Who Magazine (getting more coverage than Kevin Costner who was the biggest movie star at the time), and a full segment on Chanel 9’s A Current Affair. It was imagined and implemented as the perfect illustration of the complexity of postmodern denial of authorship and it was obviously successful as it took me almost a decade to erase the entire enterprise from my CV. Launched at the exhibition was Faylene Rheem's (now infamous) limited edition book How to Draw Women. Constructed with images mostly scanned from how-to-draw books, it was presented in a style somewhere between Walter Foster's "How to Draw ..." books and popular or trashy magazines such as Picture Magazine. Not that the presentation was consistent, since each page was made up in familiar ransom-note style as evidence and parody of the many computer graphic programs used to create the book. Naturally, the book featured no original drawing at all and any manipulation of the images was done with one megabyte of computer memory, considered powerful at the time. Obviously, graphic or drawing programs have advanced greatly since the book was created in 1992. Two copies of the book are in the National Gallery of Australia Collection, several State galleries, the Harvard University Library Special Collections in the USA and most significant collections of artist’s books in Australia. Series of works with shaped painted wood and plastic laminate making up shallow three-dimensional boxes. 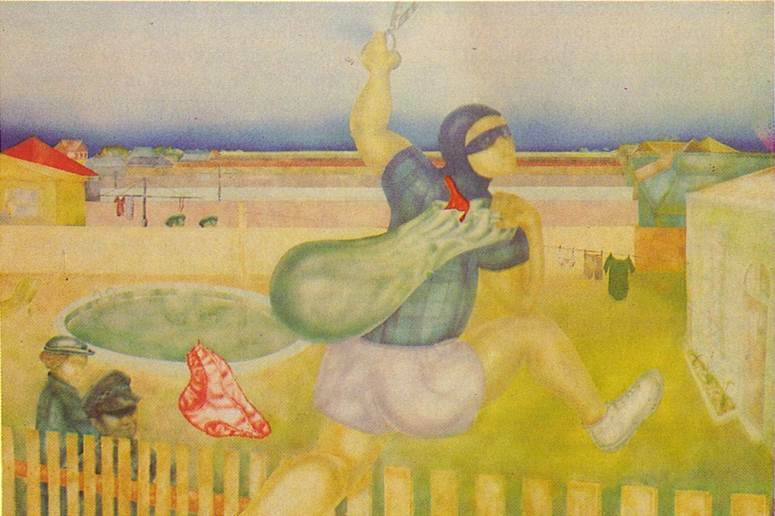 The work on the left Butchers 1988 was reworked with a very large frame in decorated granite laminates and is now in the University of Newcastle Art Collection. Series of shaped figures making up free-standing and box works imitating the format of pop-up books. 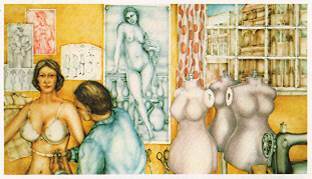 Ross Woodrow solo exhibition 1983 Phillip Bacon Galleries, Brisbane. The design and catalogue essay were all the work of Rob Jago the Director of Ulmarra Galleries at both Ulmarra, in NSW and the Gold Coast, QLD. Since he didn’t bother to show me a proof before publication, to say I was shocked to see it is an understatement. 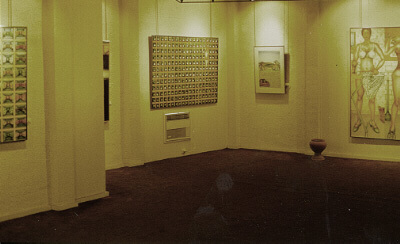 Ross Woodrow solo exhibition 1980 at STUDIO ZERO, Gold Coast, Queensland.